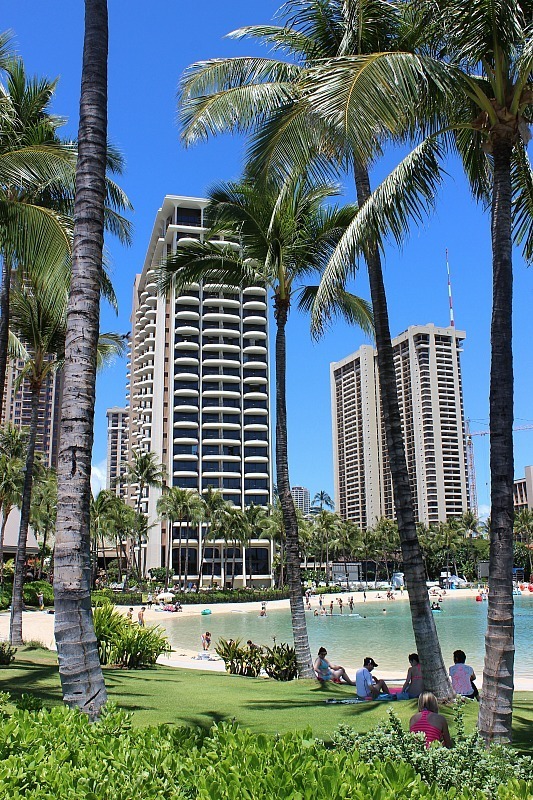 Visiting Waikiki is on all traveler’s list of things to do in Oahu. 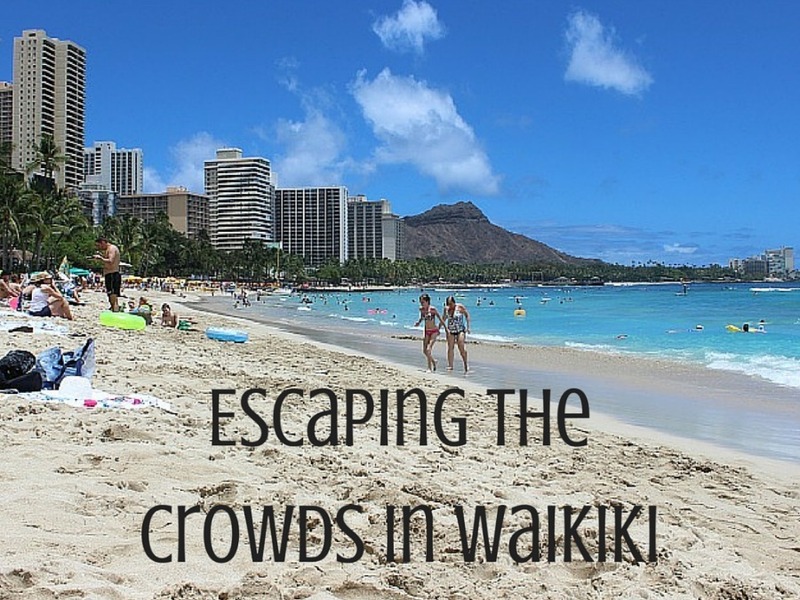 Which is why escaping the crowds in Waikiki is easier said than done. It is definitely one of the most tourist filled places I have ever been. After visiting the Big Island, Kauai and Maui, I much prefer the quieter corners of the Hawaiian Islands – my favorite spot is the chilled out North Shore of Oahu – but it can be fun to explore the craziness of Waikiki too. The beach is undoubtably beautiful and the shopping and dining scene is huge and varied. You can definitely see why a visit to Waikiki is one of the top things to do in Oahu. It’s just a shame about the hoards of people. Whenever I visit Waikiki I do like to delve into the tourist side of this resort neighbourhood. I will swim on Waikiki beach, I browse the shops and I have even eaten at some of the big American chain Restaurants – this time it was the Cheesecake Factory – but there is only so much I can take. What I have found after multiple visits to Waikiki is that the tourists tend to congregate in large numbers in certain areas: primarily the main shopping streets and Waikiki beach fronting the big resorts. If you venture out of these areas you can avoid the crush and discover a quieter side to Waikiki. And the good news is that a lot of the quieter but fun things to do in Waikiki, and Oahu as a whole, are free or cheap. There are soooo many dining options in Waikiki but it is always the chain restaurants that seem to have the longest lines. I don’t get that. Why visit them when you can try somewhere local with less people? During my short two night stay in Waikiki this time around I ate at a couple of different places that were away from the tourist zone. For killer garlic shrimp, make sure you check out the friendly hole in the wall spot that does them the best – Sam’s Kitchen. It is tucked away back towards the canal but is worth leaving the beach for. I visited the Pau Hana Food truck village a couple of times for lunch and dinner. Granted, it isn’t exactly tourist free as it is in the tourist zone but there weren’t many people there both times that I visited and the garlic shrimp plate from Five Star Shrimp was indeed five stars. UPDATE Jan 2019: The Pau Hana Food Truck Village is currently closed but will re-open in Summer 2019. On my last morning I made the 30 minute trek inland from the beachfront to Leonard’s Bakery for their famous malasadas: Portuguese donuts. Leonard’s has been a local institution since it opened in 1952 and there was a line when I visited but it moved fast. I chose the haupia (coconut) and macadamia nut custard filled versions and they were certainly worth the hot walk. On my way back through Waikiki to return to Sydney I visited the delicious and healthy Banan Food Truck on the way up to Diamond Head for Banana frozen yoghurt with fresh fruit and crispy quinoa – so good! They also have other locations in Honolulu. Despite being smack bang in the middle of the tourist zone, the tropical grounds of the Royal Hawaiian Hotel are usually deserted. It’s the perfect place to admire the glamour of the grand pink hotel buildings and the magnificent banyan trees crisscrossed with vines surrounding them. There are fish ponds and colourful flowers throughout the stunning grounds and at night the trees are lit up with lanterns making it just as beautiful as in the day time. The Royal Hawaiian Hotel and grounds are the perfect picture of what I imagined Hawaii to be like before coming here, and it retains the class of an earlier time in Hawaii’s history. Grab a takeaway lunch and sit among the greenery to enjoy the peacefulness in this bubble of tranquility. This is one of my favourite spots in Waikiki and should be on any list for things to do in Oahu. OK so this one does get pretty busy but most people tend to congregate on the beach to watch the sunset leaving the rocky pier with plenty of space to sit along. I took a cold Hawaiian craft beer that I bought from an ABC Store and sipped on it while watching the fishermen along the pier and waiting for the sun to set. It set behind the mountains and lit the whole sky up. You can’t beat a Hawaiian sunset; It was pretty damn magical. You have to swim at Waikiki beach at least once but as soon as you get over the crowds (that won’t take long) there are so many other beaches to swim at that are within easy walking distance from central Waikiki. One of the easiest to get to is the small beach at end of the Sheraton boardwalk. It is only minutes away from busy Waikiki beach but every time I went there were only ever a handful of people. I also felt a lot more comfortable leaving my stuff on this beach as there are bushes you can tuck it under so its out of sight. Continuing on further west is Fort DeRussy, a large park with a long stretch of beach. It still sees a fair amount of tourists but much less than Waikiki beach and the beach is bigger so it is more likely you can find a spot to lay your towel. Ala Moana Recreational Park and Magic Island Lagoon can be reached from Waikiki by walking 40 minutes or by taking a short bus ride. Magic Lagoon feels more like a large swimming pool and for those of you that are scared of sharks (like me), this is a great spot for swimming in the calm waters that are protected by a breakwater. A lot of locals head here for beach time. San Souci Recreational Park south east of Waikiki beach is a great spot to see local Hawaiian families barbecuing and picnicking in the park behind the beach and is another great spot to watch the sunset. With so many options it is easy to escape at least some of the crowds. And beach time is a must of things to do in Oahu. The best time to visit Waikiki beach is once the sun has set. It is the only time when there are no crowds and it is relatively peaceful. I love walking along the darkened beach past the bright lights of the waterside resorts. On this visit I was lucky enough to catch a hula performance at the Royal Hawaiian, it was just as good seeing it from the back from where I sat on the sand. And I didn’t have to pay a penny. Every Friday at 7.45am the Hilton Hawaiian Village has a free fireworks show and one of the best places to see it is the Fort Derussy beach or pier. Get there early to nab a good spot. Waikiki is a fun and lively holiday destination and if you mix some of the quieter spots into your visit, you won’t get burnt out by its hectic pace. Do you have any tips for enjoying Waikiki away from the crowds? Would any of these make your list of things to do in Oahu? Waikiki sounds fun – sometimes its nice to just dive into the touristy areas and see it as its own experience but it’s also great to try and find the spots to escape! The hotel grounds look so pretty! We are planning our first Hawaii trip – these are great tips! Thank you for sharing! No problem Crysta, enjoy Hawaii! Agreed – it’s always so much nicer venturing that little bit away from the main tourist spots to find a bit of peace and your own space. I sort of love crowds up to a point (maybe just because I’m nosey and love people-watching), but after a bit it can get a bit tiring. I’d definitely be following this advice!